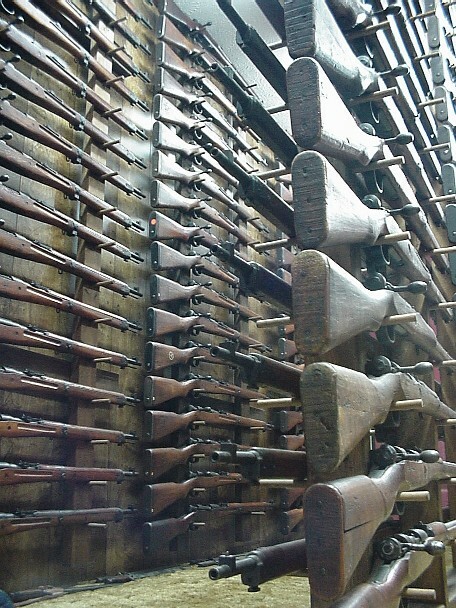 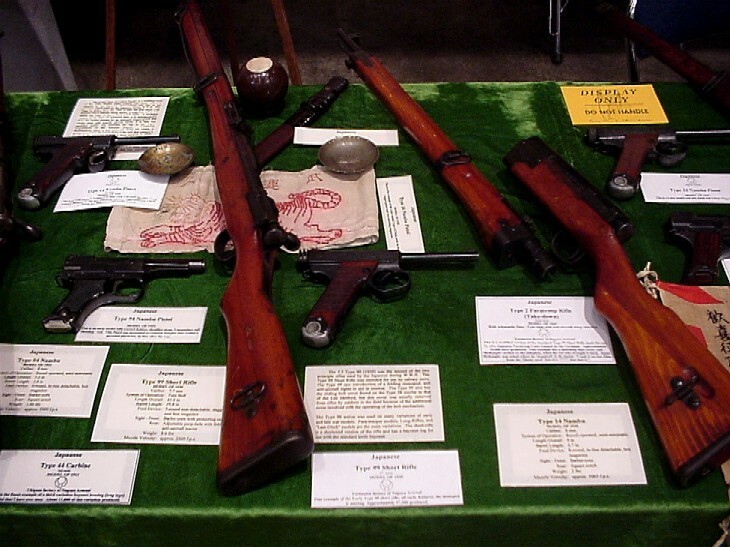 Various 99 Short rifles are pictured above, possibly one of the finest collections in the nation. 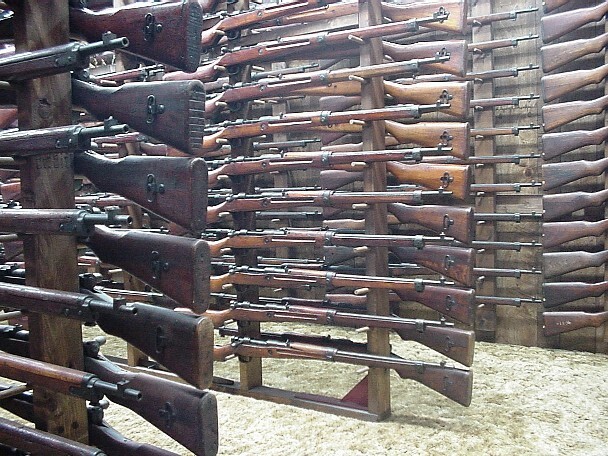 The ulitimate goal of this collection is to have one rifle before, 1 rifle exhibiting, and 1 rifle after each change in manufacturing from each arsenal. 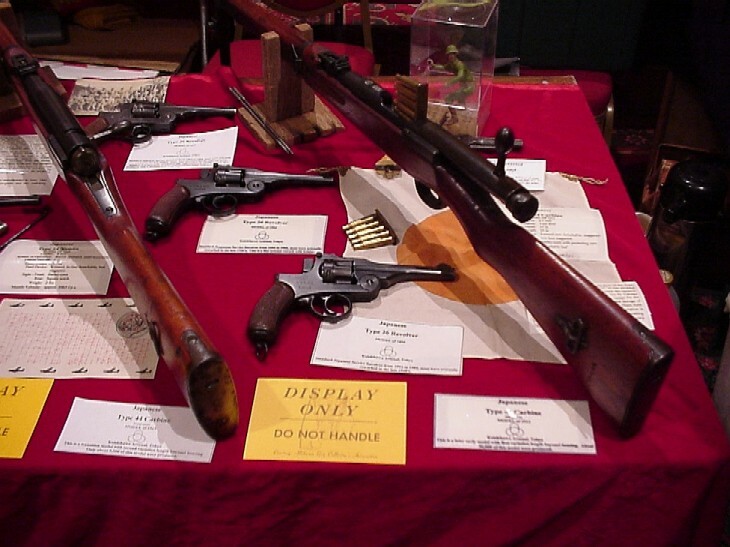 Tennessee Militaria Collectors Association Show Thanksgiving weekend 2002, Second Place Winner, Japanese Pistols and Type/Model 44 Cavalry Carbines. 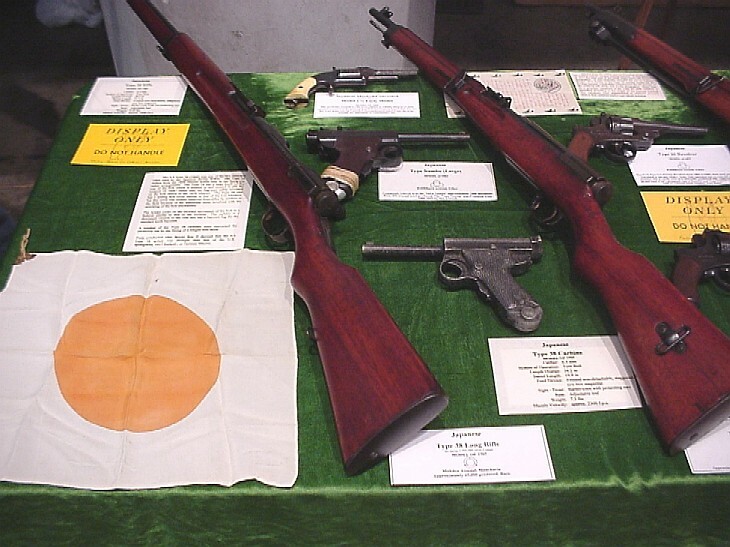 The pistols range from a Japanese marked Smith & Wesson Model 1 1/2 to a March 1945 Type/Model 94. 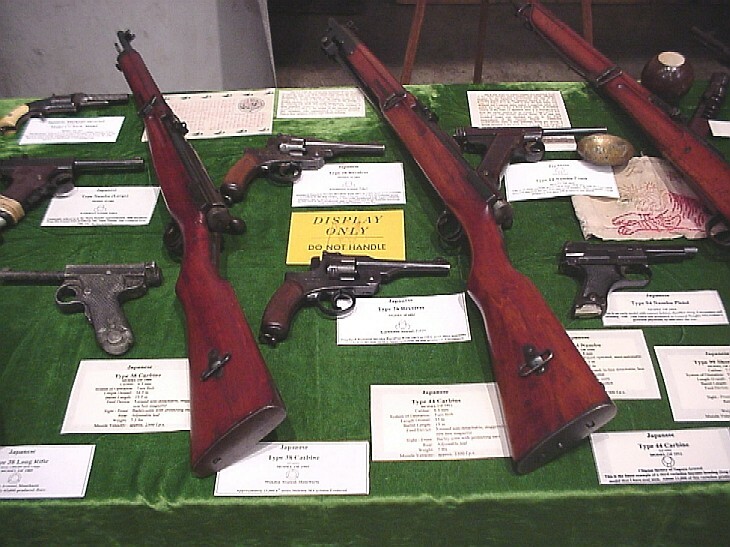 All major models of the 44 Carbine are represented here except for an early to late configuration rework and a Nagoya 0 Series gun. 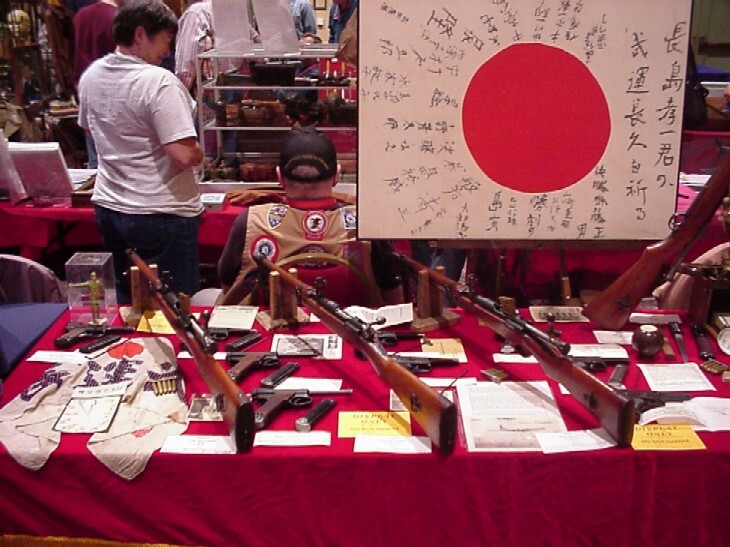 Various knick-knacks are also displayed, Thousand Stitch Belts, Military Sake Cups, Flags, Daggers, Propaganda leaflets and other paper documents are exhibited as well. 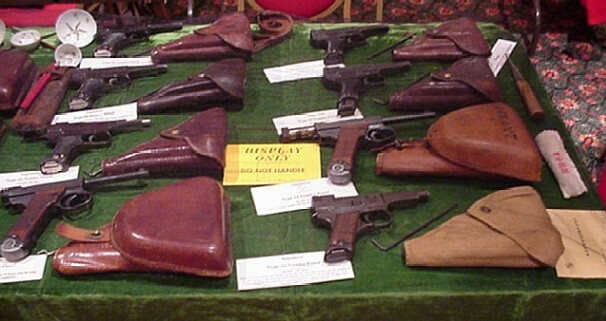 Central Alabama Collectors and Shooters Inc Show March 15-16 2003, No Display Prizes, therefore small display. 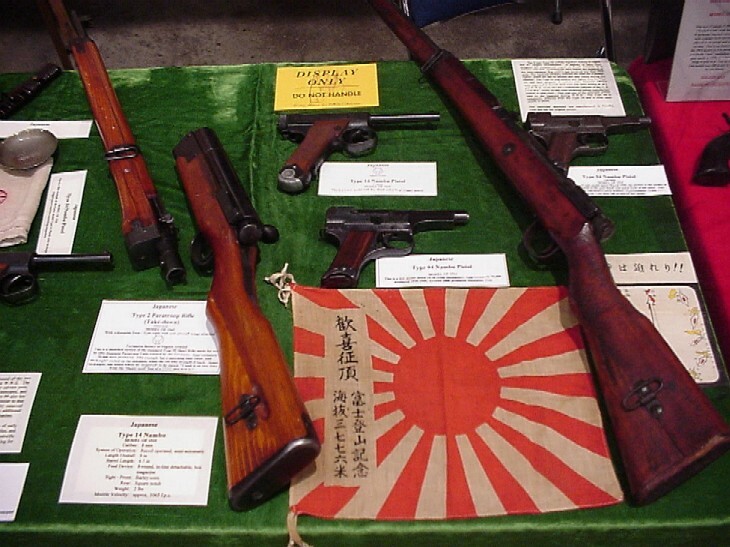 Japanese Weapons. 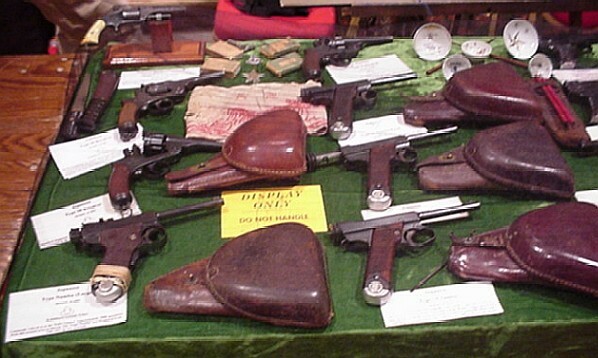 The pistols range from a Japanese marked Smith & Wesson Model 1 1/2 to a March 1945 Type/Model 94. 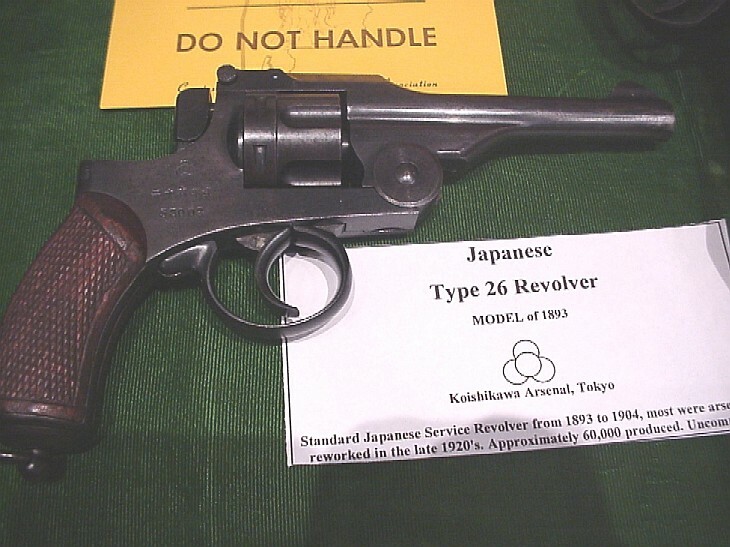 A Tokyo Papa Nambu, a Dummy Papa Nambu, an un-externally numbered T26 revolver, a standard T26 revolver, 3.6 Nagoya T14, 14.10 Nagoya T94, 18.6 Nagoya 1st series LTG T14, 19.8 Nagoya LTG T14, 19.10 Nagoya T94, 20.3 Nagoya T94 "Square Back". 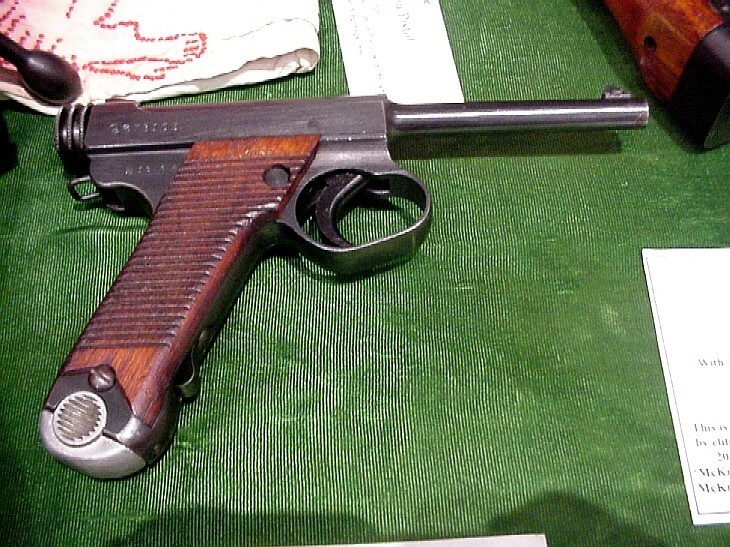 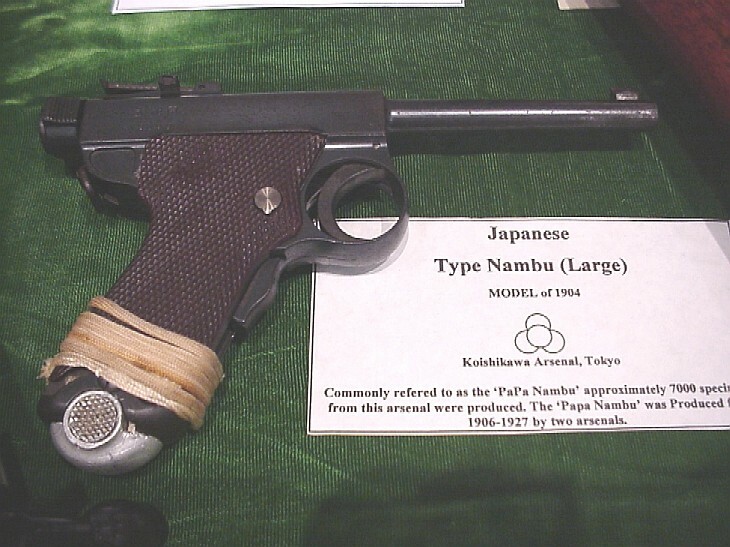 Major models of Japanese Pistols were displayed. 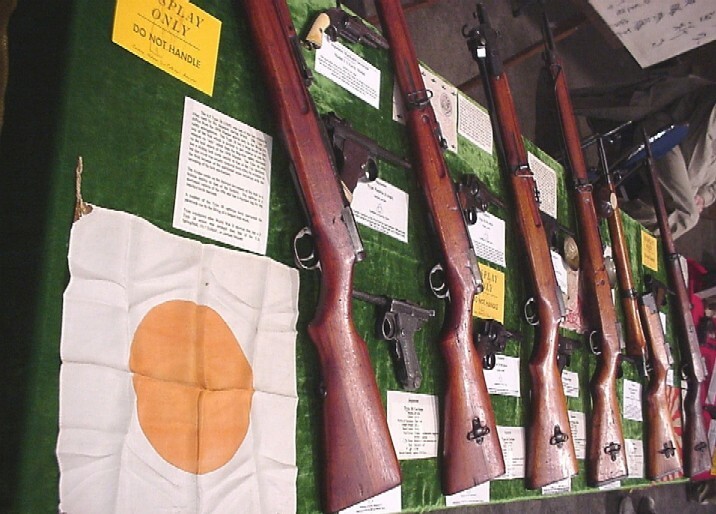 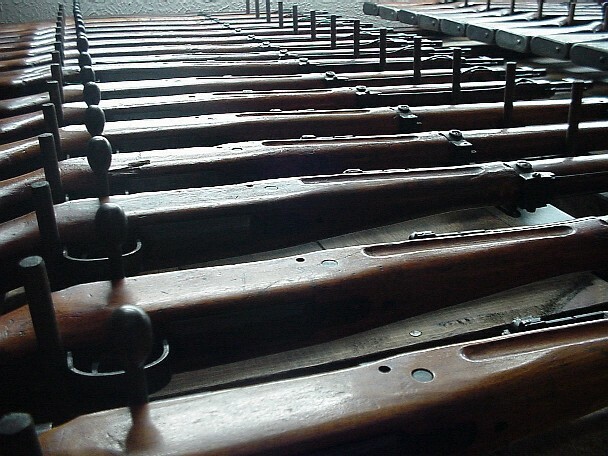 The rifles included Mukden (Hoten) Arsenal 38 Long Rifle, Mukden (Hoten) Arsenal 6th series 38 Carbine, Nagoya Arsenal 2nd series 44 Carbine with 3rd (long) variation bayonet housing, Nagoya Arsenal 2nd series 99 short rifle, Nagoya Type 2 Paratroop rifle, Kokura Arsenal 25th series (last ditch) 99 Short Rifle. 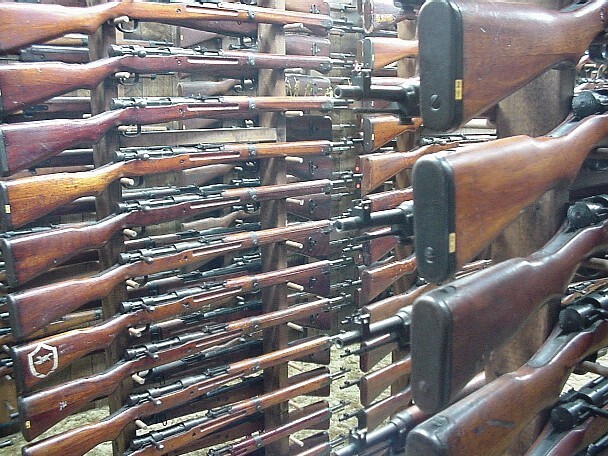 All rifles displayed were Matching and 'Mummed'. 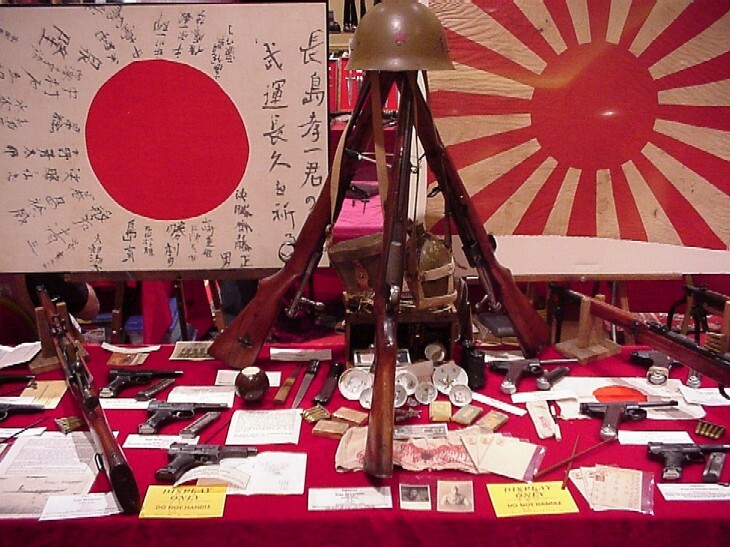 Various knick-knacks are also displayed, Thousand Stitch Belts, Military Sake Cups, Flags, Daggers, Propaganda leaflets and a ceramic hand grenade. 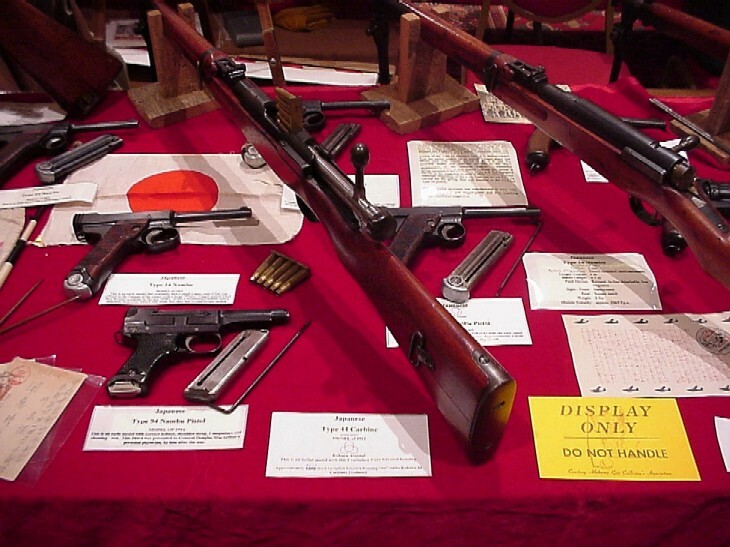 The background on this page is a representation of the Royal Chrysanthemum generally found on the receiver of most Japanese Military Rifles, signifying ownership of the Emperor.